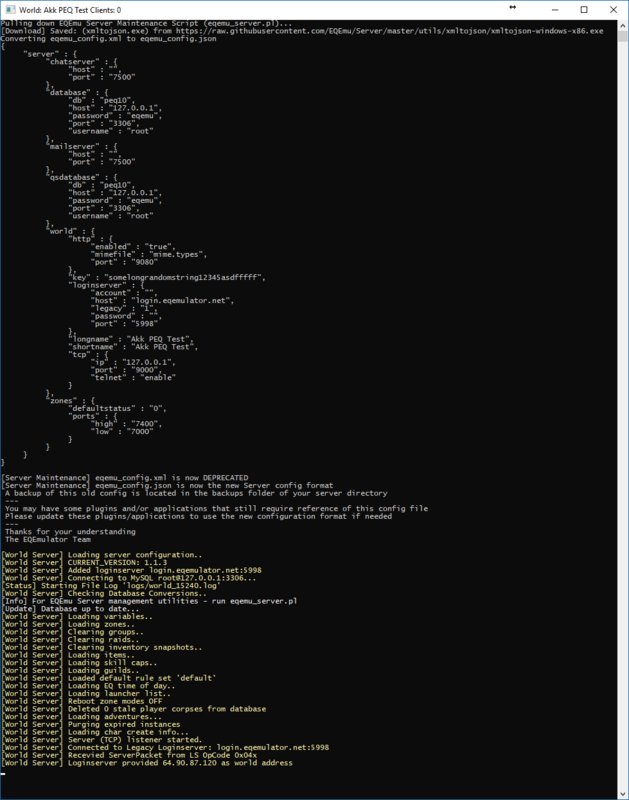 Thanks to the work of Shin Noir (Xackery) from RebuildEQ, we've converted our server config loader from XML to JSON. World will use the new eqemu_config.json effective immediately. All other utilities that were built around loading config variables from XML will have to be adjusted or updated to use the JSON format. If you find any tools or utilities tied to the old XML format that needs to be changed or adjusted, let us know in this thread and we will make sure that things get adjusted appropriately. is anything planned for the future that would interfere with older binaries patching into the public eqemu login server ? eqemu_server.pl file and replacing it. Just kept doing that continuously, (looped) It was just a test box anyways. I also tried just running the script by itself (without binaries) and got the same thing. and the precompiled downloaded ones. Couldn't get past the "hanging" with any new binaries. and oddly enough, it's setting a db version for bots, which I don't even have enabled, lol It set the version at 0 in DB. This is all on a test box that I'm using to help work out bugs, so I can freely wipe the server and redo anytime. [Database] Setting Database to Binary Version ((xmltojson.exe) from https://raw. I just ran a conversion using the latest script and latest binaries and it converted just fine, not sure how you're running into that issue. Are you running your server binaries within the context of the server directory? Are you doing something different? I can confirm I also just ran the latest script on a virtual machine that hasn't even been turned on for 6 months. It converted the .xml to .json without issue. Look at your eqemu_config file, and check the top line. It is saying it can't find the server element..
See if server is there. Is it by chance not all lowercase ? e.g. Server? for db updates, like I've been doing for a long time now. Just to add: I've been trying to get it to convert the config over to json.(again). I have 3 different configs setup on this one box, for test. config and putting one of those old configs in, it won't convert them now. whenever new binaries are used, world.exe will automatically pull down a config converter before attempting to load the config. Here, just to simplify what I am talking about. I put new binaries in the folder. There is an eqemu_config.xml file in there. cannot open file at eqemu_server.pl line 326. [World Server] Loading server configuration..
Syntax error: value, object or array expected. [World Server] Loading server configuration failed. if your xml config has "special characters" in the server name, the conversion won't work. I removed them and problem solved. Interesting, but why not just use Lua for config since the server is already being linked against it?